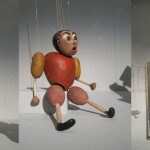 Terrifying puppets of the Bauhaus. 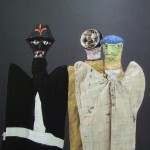 UncategorizedComments Off on Terrifying puppets of the Bauhaus. I recently spent my birthday at the fantastic Bauhaus exhibition at the Barbican. One section was dedicated to children of the Bauhaus and displayed toys made by the artists/designers for their wunderkinder. I felt the need to share a few, truly the stuff of nightmares. 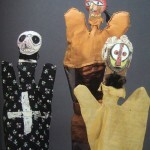 Crude angular marionettes constructed from splintered wood and pointy metal (one had nails for eyes), undead hand-puppets moulded ‘lovingly’ from papier mache by Paul Klee for his son Felix. My particular favourite was named ‘ghost of a scarecrow’ (far right pic, white face on the left), because normal scarecrows just aren’t scary enough. And to soothe the heart have a listen to some wonderful warm textures from Motion Sickness of Time Travel.